The repo rate above the federal funds rate is an assault on everything we’ve been taught. There is supposed to be a risk-driven hierarchy that governs financial markets, every single one of them. The global economy depends on it. If you are judged to be a higher risk, that’s who pays the higher interest rate. But repo is lower risk.  How can any participating financial institution sit there and let a secured interbank rate cost so much more than an unsecured? What does that mean? That’s the big problem here. Trying to filter these real-world results through the prism of what you’ve been taught in Economics class, the shorthand that persists associated with being an investor (don’t fight the Fed! ), or what passes for conventional economic wisdom renders these signals useless. It seems utterly confusing. And that may be all you really need to know. Take a swap spread, for example. A negative one means what? In textbook terms, if the fixed rate paid on an IRS is less than the risk-free UST yield, this would appear to indicate the market is judging the US government as the riskier counterparty. Nonsense. Quite literally nonsense. 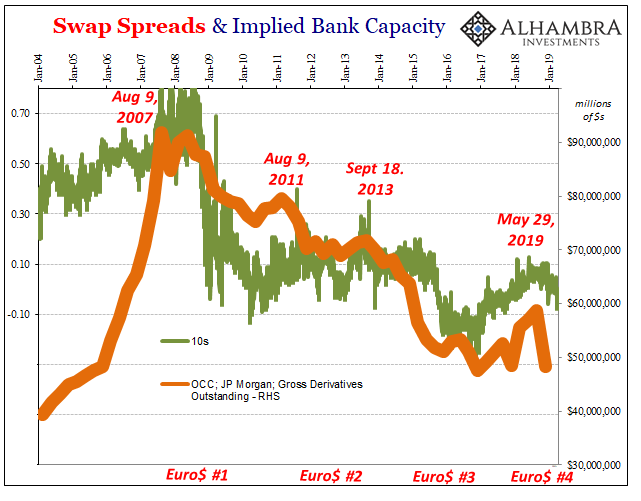 While on the surface it would suggest that the “market” in swap derivatives is pricing more risk of UST’s than swap counterparties, the only real inference about such compression is the nonsense itself. In other words, the nonsense nature of negative swap spreads is precisely the point – for them to be negative in the first place, let alone highly so (like the 30s again), is a pretty unambiguous signal of malfunction if not full distress. 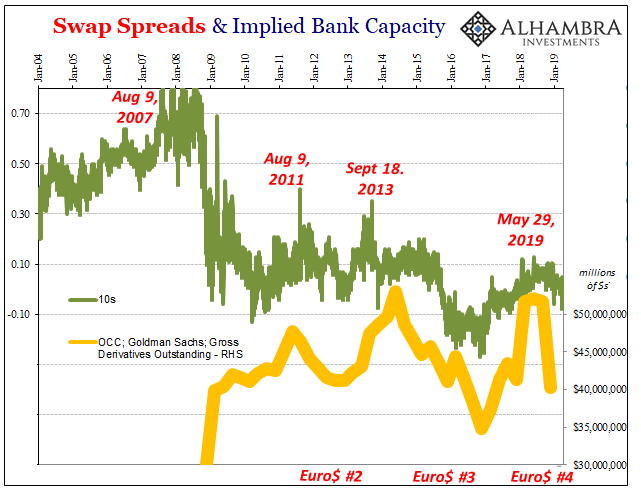 It is only great imbalance that can change the information content of a market price into meaninglessness; therefore, we can interpret that case as some great reduction in balance sheet capacity since it is dealer capacity that determines the nature of the spreads. When you see such nonsense in the real world your first, and maybe only, intuition should be, something is wrong here. 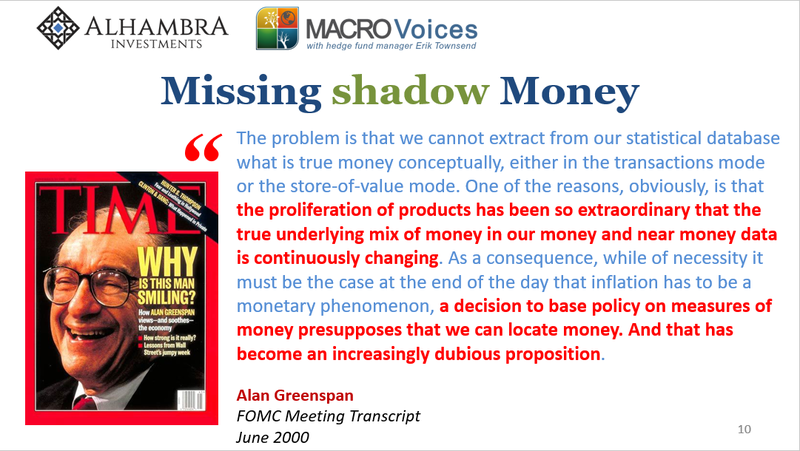 What’s left out of the Economics textbook and never makes its appearance on CNBC or in the FOMC’s boardroom is how it requires banks and specifically money dealer banks to make sense of money in operation. Markets are messy, so to achieve order out of chaos it absolutely requires policing. Arbitrage and the capacity to undertake it. Forget what a negative swap spread or upside down repo “means”, simply ask yourself, where are the dealers? In other words, whenever we see this nonsense it tells us that something, some great monetary capacity is surely missing. 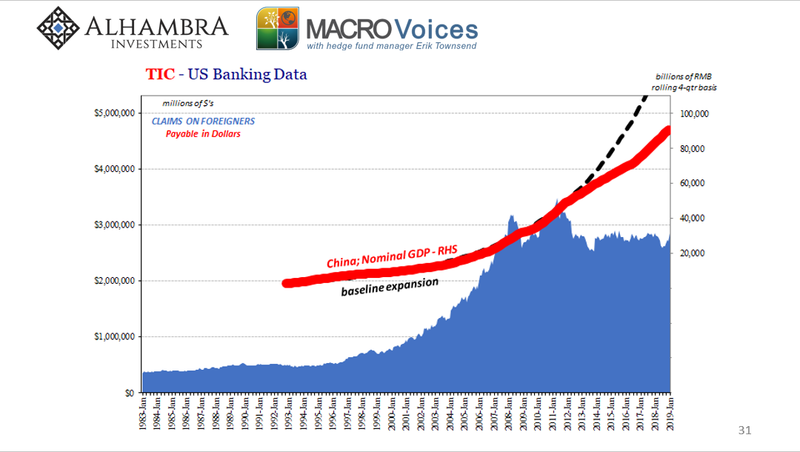 Beginning with negative swap spreads, this real-time market nonsense, we notice how at the very same time foreigners suddenly begin to sell their US$ assets and then how US banks engage in much less US$ cross-border activity and then how it ends up, in real-time, with US$ money markets displaying their own brand of nonsense; federal funds, too. We may not know it from the textbook, but the same thing is missing from each piece; and one you put that together, the nonsense makes perfect sense. 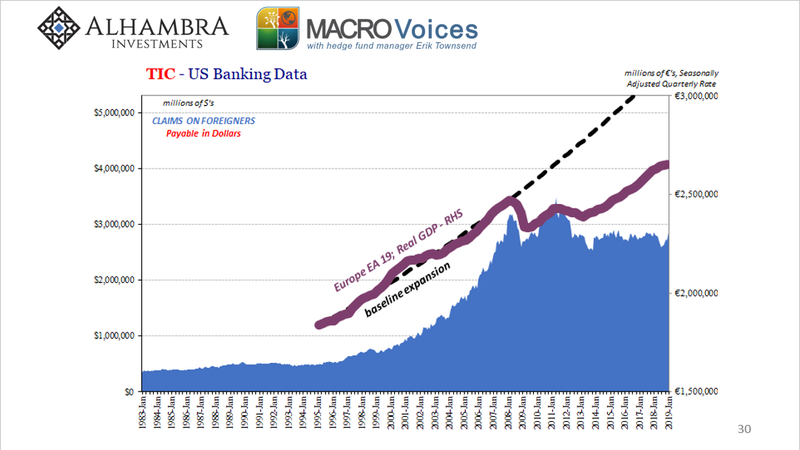 There is a mountain of consistent evidence that spans across an enormous length of time which all points toward the unseen eurodollar – the global monetary system that runs on balance sheet capacities. While the FOMC was discussing their green shoot-like optimism in June of 2008, there remained so much market nonsense (LIBOR spreads, fed funds counter spreads, ABS CP, etc.) arguing instead how balance sheet capacity was still imperiled. Bill Dudley had been right: global banks had sat to the side and watched, perfectly aghast, as Bear Stearns showed them what real risk was. He, Bernanke, and the rest of them were utterly wrong in downplaying the significance of the transformation. They thought these banks, in the end, would mean little to the economy. They believed, and still do, the central bank would matter so much more. Rather than some minor nuisance for greedy subprime peddling Wall Street bankers, it drove a stake right through the heart of the global monetary system. Ever since, balance sheet capacity has been at a premium. Not a continuous, straight-line shortage, but an intermittent one that gets to serious dimensions when the squeeze (inevitably) comes back. The circuit becomes complete. 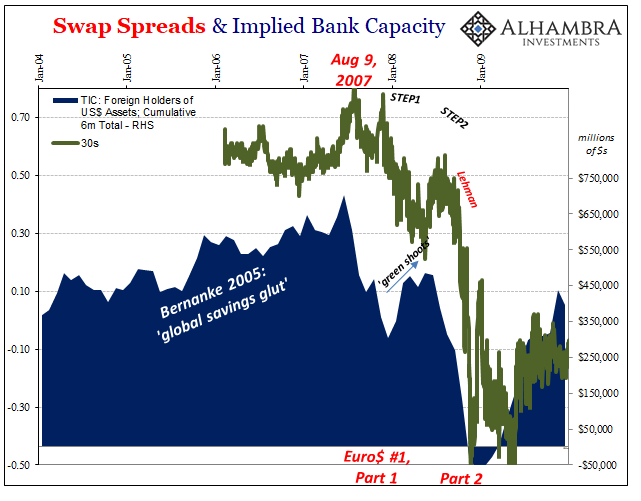 Compressing and negative swap spreads: balance sheet capacity at a premium; US banks cut back on US$ activities outside the US; foreigners buy less and even outright sell their US$ holdings; and US$ money markets exhibit terrible breakdowns of hierarchy. Classic tight money symptoms, only officials cannot define nor locate the money which might be tight. I haven’t even included eurodollar futures or the UST curve, either. Still more real-time prices that match up with everything I’ve shown you here. The evidence is consistent, tested, and, I believe, overwhelming. This is what science is supposed to be. Bottom line: the global reserve currency system as it is, not as it is written in the 1950’s era Economics textbook, needs banks, not central banks, to create monetary resources and then redistribute them all over the world. We cannot directly observe these monetary resources because they are bank liabilities. All that means, for our purposes here, is that these require bank capacities for banks to engage with them; there has to be balance sheet “space” available to perform these monetary functions. 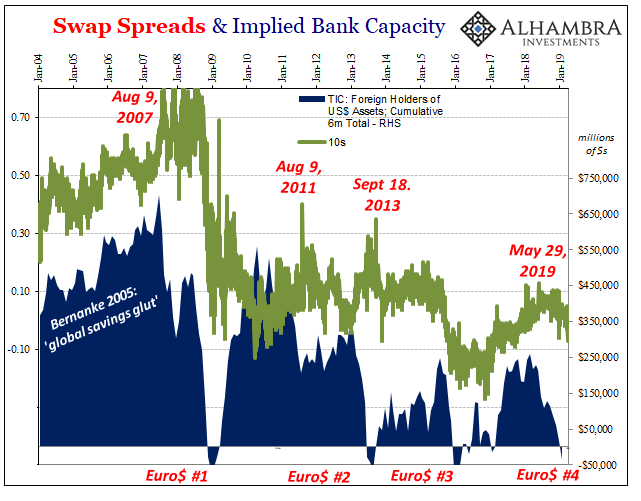 The premium on swap spreads, maybe more than anything around, gives us an idea of this shortfall. If it is at a premium, for whatever reasons (we are dealing with “what” here and will get to “why” at some future day), the results are consistent with a broad-based effective money shortage. I call this currency a eurodollar because the term is the best one which fits with what we can observe – an offshore, dark shadow money system. Credit-based money. We can’t directly tell what banks are doing because how would we? The modern global behemoth is an incomprehensible tangle of complex functions. And that’s just what gets reported once every three months. It requires a bit of extra work to figure out what they are all up to. Or when they don’t want to perform these necessary reserve currency functions. 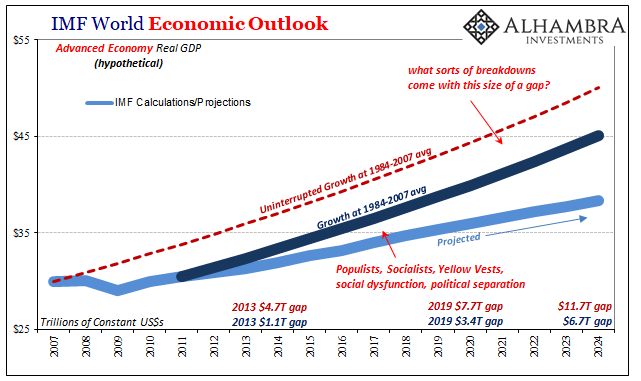 It is a warning to those in 2019 who now see green shoots or are breathing a sigh of relief because the Fed “pause” to them means it wasn’t anything other than a growth scare. The Fed is, largely outside of temporary sentiment, irrelevant. The central bank is not central to what’s on evidence here. The consequences of what is central go way beyond a prospective global downturn in 2019. The stakes are enormous. 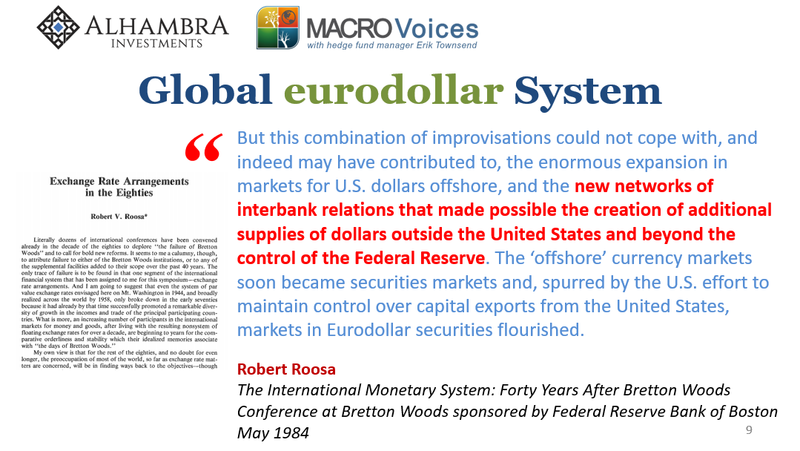 And yet, practically no one has ever heard of a eurodollar. Even those who have, those like Thomas Hoenig, Jeffrey Lacker, and Janet Yellen, they have no idea what it really means. 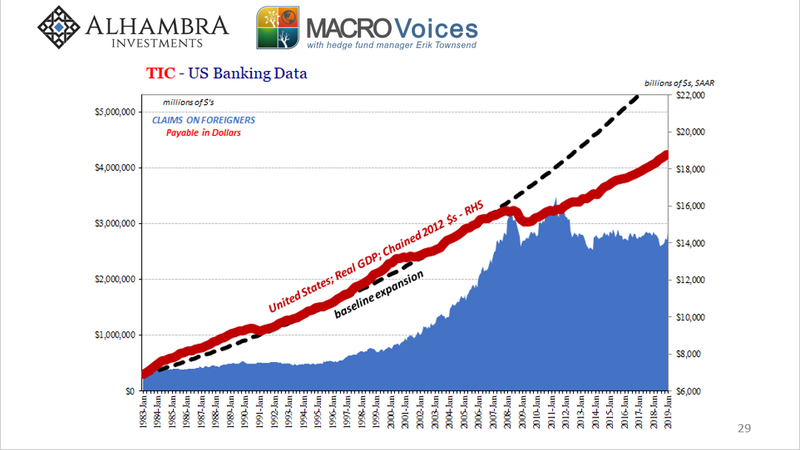 To the general public, including those fed up with the Fed, global bank balance sheet capacity might as well be poorly written science fiction. All because Economics is not serious science. Central bankers are all Economists. It is therefore left to everyone else to do the job. Tune in to MacroVoices next Thursday, April 18 for the big picture.